On 9 December, Medtronic announced the first-in-human implant of its Micra Transcatheter Pacing System (TPS). According to the company, this is the world’s smallest pacemaker and does not require transvenous leads. The device was implanted in a patient in Linz, Austria, as part of the Medtronic global pivotal clinical trial. At one-tenth the size of a conventional pacemaker, and comparable in size to a large vitamin, the Micra TPS is delivered directly into the heart through a catheter inserted in the femoral vein. 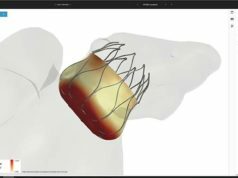 Once positioned, the pacemaker is securely attached to the heart wall and can be repositioned if needed. The miniature device does not require the use leads to connect to the heart. Attached to the heart via small tines, the pacemaker delivers electrical impulses that pace the heart through an electrode at the end of the device. The Micra TPS is an investigational device worldwide. The study is a single-arm, multicentre global clinical trial that will enrol up to 780 patients at approximately 50 centres. Initial results from the first 60 patients, followed-up to three months, are expected in the second half of 2014.